This author also wrote Me Before You, a book I enjoyed. It's the story of a paralyzed man and the woman that is hired to be his nurse/companion. You should also read that one! Then Jess meets Ed Nicholls. She is his house cleaner and one night she also rescues him from driving while intoxicated. Jess also works at the bar where he became drunk. Eventually, he will rescue her. Tanzie you will find out is a little math genius and needs to go many miles from home to compete in a math tournament. If she does well they can earn a lot of money and this will help finance her further education at a private school. This is where Ed comes in. He has a car and drives them a really long distance. You should try this one. It's well written with some funny parts and some with great insight. It's the story of the two families and all the problems each has. Five Stars! This author also wrote a popular book called Room about a boy and his mom that were held captive for many years. It was quite mesmerizing. So was this one! This is the story of Anna, an 11-year old girl that has not eaten in four months, yet still lives and appears to be thriving. The setting is the middle of the 1800's and Anna lives in a small Irish village that is steeped in superstition and religious practices. Into this picture comes Lib (Elizabeth) who is an English nurse. Lib is hired, along with a nun, to "watch" the girl for two weeks and see if she is actually eating or if she is indeed a miracle. Lib examines and her and takes daily notes about the girl's condition. Of particular interest is the number of visitors. People come to see her from far away and often leave money in a money bin as they leave. Where does this money go? The writing style of this book is very simple and has a slow pace. There were a few times I wish she would just get on with the story, but those details will lead to a conclusion you might not be expecting. I give this one 4 stars. Let me preface this review with a note about the author. Sometimes I love her books. Sometimes I just wish she would stop. The writing style makes me nuts. She writes in short sections and every single section ends with some writing that is meant to be profound revelations or life meanings, but I personally just get tired of it. With this book, I stopped reading the last sentence of every section and it made the book better. Just sayin'. So, what is the story? Delia is engaged to Eric, who is a lawyer. The third very dear member of the trio is Fitz. They have been friends, all three of them, since childhood. Eric and Delia have a daughter named Sophie. Delia and Sophie live with Delia's dad, Andrew. Delia's mom was killed when she was four. Turns out she wasn't killed and Andrew is arrested for kidnapping Delia. This is not a spoiler- 80% of the book is about Andrews's arrest and time in jail and then his trial. 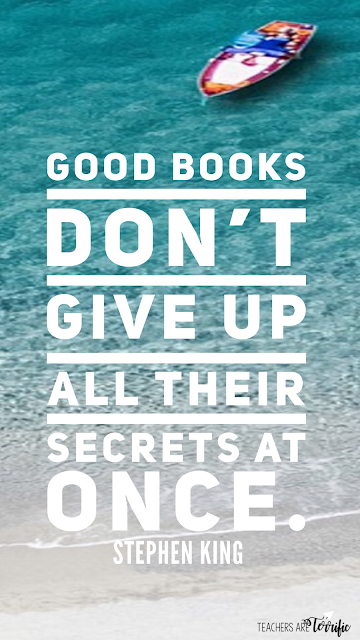 I won't tell you anything else because it would spoil the book! I do have a couple of problems with this one- despite the fact that I read it quickly. (That could be because I skipped those superfluous ending sentences of every silly section.) I did want to see what was going to happen with Delia and her mom when they are reunited. But, here are the two things that bothered me. Andrew is sent to prison while awaiting trial. Is that normal? Why is he in a violent gang-filled prison while being tried? I thought (maybe wrongly) that a city or county jail would be the place for him. So, a lot of the story is about how Andrew is acclimated to prison life. Not necessary to the story. "I tell him I [want a dinosaur], and he laughs. "I know what you want," he says, and then he swings me into his arms and so high that the sun kisses blisters onto the soles of my feet." Seriously. The sun kisses blisters. Anyway, I did finish the book and was happy with it- mostly. 3.5 Stars! I have liked other Picoult books more than this one! The east Texas town of Lark is the setting for this murder investigation. Darren Mathews, a Texas Ranger, comes to town to look into the murder of a black lawyer that was visiting the town and a local white woman. Both have turned up in almost the same location within a few days of one another. Darren is drawn to the case because of his roots in Texas and his allegiance to the Rangers. The town is very resistant in cooperating with his investigation. In the meantime, Darren has his own problems. He is somewhat estranged from his wife and does have a drinking problem. Into this mix let's add some details about a gang, the Aryan Brotherhood of Texas. It is possible (and also possibly a secret) that some of the residents of Lark are part of the gang or trying to become part of it due to being incarcerated. Darren must somehow solve the murders while dealing with the townsfolk, the widow of the murdered man, the animosity of some of the people, and his own demons. There are lots of details in this story and it is quite well written. The writing was rich with descriptions and I did like that. About three-fourths of the way into the book I grew tired of it and just wanted it to be over. So, I will give it 3.5 stars. It's good and you will like the writing, but it could easily be about 50 pages shorter and be fantastic! Cass is driving home one evening after a party at work. It is stormy and her husband has suggested that she should not take a shortcut, but she does anyway. In the pouring rain, she happens upon a car that is stopped on the roadside and she pulls over to help. Only she doesn't help. Cass is too scared to get out of her car and drives away. The next day the news is all about the murder of a woman- and it is the woman Cass saw. And it turns out to be someone Cass knows. Then the real story begins. Cass appears to be in the beginning stages of early onset dementia and her forgetfulness and odd behavior becomes a concern to her and her husband. Strange packages arrive at their doorstep and it turns out to be something she ordered but cannot remember ordering. She can't make the microwave or washing machine work. She cannot remember the alarm code. She is also obsessed with her fear of the murderer. She thinks the murderer is going to find her because she is a potential witness. Every single day, multiple times a day, the phone rings and no one is there when she answers. She "knows" it is the murderer. Someone keeps coming into her home even though there is an alarm. Are these things really happening or is it due to her memory losses? To be honest, at some point this story began to drag just a little. I was beginning to wonder if the book was ever going to get to the point or was it just about the weird things happening. Then, something happens that changes it all. You will think you have this one figured out and I did (partly). Stick with it because the last 100 pages will fly by as all the secrets come together. I would give this one 4.5 stars. It kept me flipping the pages even in the middle of a football game (and it was a nail-biting football game). Another month of books for you to try! Can you solve all those secret events? One more thing- Do you use EReaders? I have tried a Nook and a Kindle and I love both, but sometimes I forget to carry them with me. Guess what? You can get the Kindle app and use it on your phone - so your book is always with you! If you think it's too small you are going to be surprised! Also, I like the way the pages turn much better than my real Kindle!